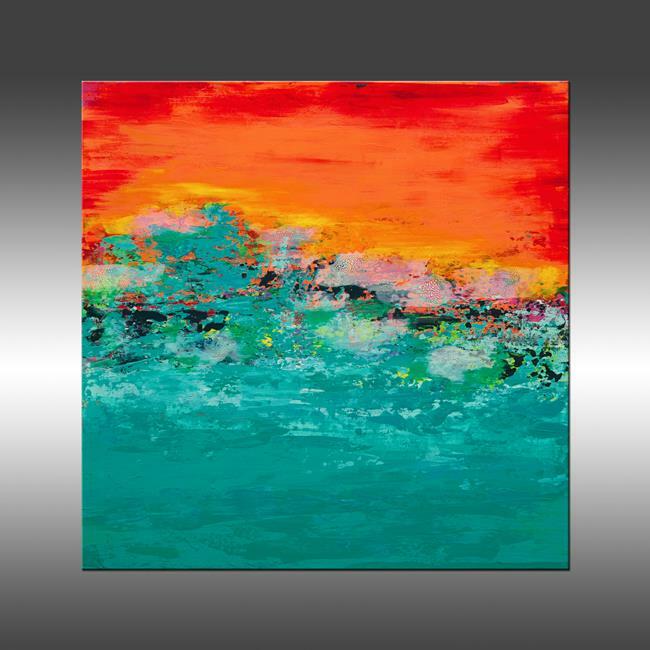 Tropical Paradise is an original, modern art painting from the Abstract Landscape series. This one-of-a-kind painting was created with acrylic paint and mixed-media on gallery-wrapped canvas. It has a width of 30 inches and a height of 30 inches with a depth of 1 inch (30x30x1). The painting continues onto the edges of the canvas, creating a finished look so the canvas does not require a frame. The colors used in the painting are blue, white, fuchsia, orange, green, yellow, red, dark gray-blue, and turquoise. The painting has rich texture and includes a crackled effect in various places. An archival, UV resistant, gloss varnish has been applied to protect the surface of the painting and a certificate of authenticity will be included with the shipment. The painting will be signed and dated on the back and signed on the front.